The beautiful hills and rich valleys of South Wales are home to many lovely country parks, most of which provide free entry. Enjoy the countryside at its best, with forest walks and a picturesque riverside setting. A series of way-marked walks and bridle paths (some on flat ground and others fairly steep in nature) start from the Countryside Centre near the car park. Also located in the visitors centre is the fascinating Welsh Miner's Museum. Facilities: refreshments, picnic sites, cycle hire. There is little that compares with this attractive old Victorian country garden, situated in the secluded upper Swansea Valley. With sweeping lawns, beautiful trees, lakes, rivers and rich meadows. Mostly level and gently sloping pathways. Dogs must be keep it on a lead. Facilities: car park, craft shops, tea rooms, restaurant and visitor centre. A seven-mile scenic drive with spectacular views that winds its way through the forested slopes of the Severn Estuary. Run by the Forestry Commission. There are play-areas, picnic areas, barbecue sites, mountain bike trails and forest walks. Facilities: car park, picnic sites, campsite and visitor centre. A vast expanse of woodland and open fields near Aberdare, in the beautiful Cynon Valley. Lovely forested, lakeside and riverside walks. Facilities: car park, play area, picnic area, accommodation, camping, bike hire & visitor centre. 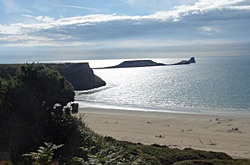 The Gower was the first area of Britain to be designated as an area of outstanding natural beauty (AONB). The peninsula is just 20 miles by 5, jutting out into Carmarthen Bay, west of Swansea. This delightful area offers plenty of scenic variety, ranging from steep limestone cliffs and sand dunes to long sandy beaches and grassy moorlands. On the south coast there are a number of very attractive little bays, such as Bracelet, Limeslade, Langland and Caswell. At Rhosili you will find a magnificent five mile stretch of sand, with spectacular walks along the promontory and causeway (tide permitting) to Worm's Head (shown above). Along the north the coastline is markedly different, an empty area of coastal plain and salt marshlands. 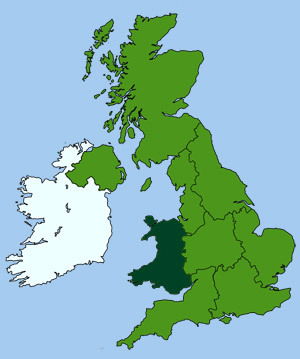 Inland there are pleasant farmlands, attractive country roads and many places of historic interest such as Pare le Breos prehistoric burial chamber and castles at The Mumbles, Pennard, Oxwich and Llanrhidian. Over 300 acres of idyllic parkland, supporting a wide range of outdoor activities, from golf and fishing, to walking and cycling. On-site camping and caravan site. 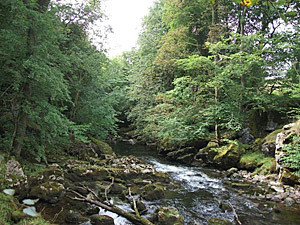 The Park, seldom more than five miles in width, stretches along the coast from the mouth of the River Teifi to Cardigan Bay. The environment is rich in natural beauty, plant and animal life. Its coastal cliffs and offshore islands are home to gannets, fulmars, puffins, cormorants and razorbills (the symbol of Pembrokeshire Park). The Wales Coast Path runs along the edge of the park and enables visitors to walk along the entire coastline, providing many spectacular vistas. The sea is rarely out of sight as the path passes over towering headlands, along cliff tops, beside beaches and around coves, inlets and estuaries. One of the South Wales most picturesque Valleys. The Vale is packed with heritage sites and natural beauty just waiting to be discovered. Visit the Aberdulais Ironworks or explore the lovely Melyn Court Falls and waterfalls in the Pont-Nedd-Fechan area. Visitors can also enjoy a pony trek through the Resolven Forest or visit Penscynor Wildlife Park. 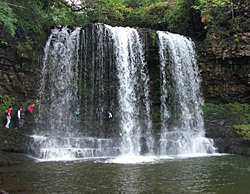 The vale is particularly renowned for its collection of stunning waterfalls. Location: easily reached from the A465 Heads of the Valleys road. Wetland nature reserve for waterfowl and wading birds and other diverse wildlife, including ducks, swans, geese and flamingos. Discovery centre, outdoor activities and cycle trails. 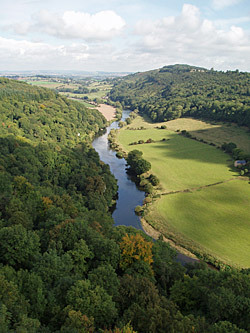 The River Wye is one of Britain's most delightful rivers, rising in the Welsh mountains, maturing on the borderlands and winding elegantly through a steep sided valley between Ross-on-Wye and Chepstow. The 8th century earthen Offa's Dyke, runs along the northern side of the valley and is one of the many superb walks located in and around the area. The village of Tintern, situated between Chepstow and Monmouth, is an excellent starting point for any exploration. Here you will also find the ruins of the famous Tintern Abbey, one of Wales's most impressive historic sites. A mile or two further south, the Wye snakes around the Lancaut Peninsula, at the foot of the Windcliffe (an 800 ft hill, with commanding views across the Severn estuary). This view of the valley (shown left) is taken from Symonds Yat Rock, a popular tourist destination.